Add 2 cool effects to any of the social icon skins! This add-on will allow for any icon set to be greyed or faded out seamlessly on page load. 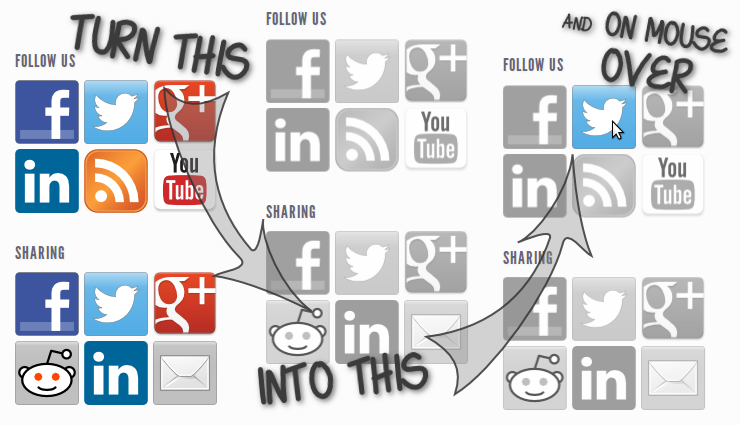 This add-on will add 2 different effects, greying out and fading, that can be applied to any of the icon skins for the WordPress Social Media Feather plugin. The add-on will use browser specific technologies to make the social icons appear either greyed out, faded out or both at the same time. The usual full color icons will then be displayed when the user moves the cursor over an icon. The effect provided by this addon works on all browsers and for all icon sets, including the ones provided by Extra Social Icons. Note: the effect provided with this add-on automatically works with all icon skins installed in the plugin, even those that come with the Extra Social Icons! Purchasing this addon helps us further develop all our free plugins and themes! Thank you for your support! Note: this product requires WordPress Social Media Feather (free) to already be installed in your WordPress site. To install this addon simply go the plugin settings under Settings -> Social Media and click on the “Grey Fade Effect” button, then follow the instructions on screen.